The Chamber of Commerce annual recognition banquet. The chamber members annually recognize a member that exemplifies the entire business community. Members are asked to nominate a chamber member business that either promotes a positive image, has a proven track record, contributes to the economic growth, plays a leadership role, made additions to staff, upgrade in technology or business structure, actively participates in chamber events or gives of themselves and/or staff in time and resources to the Chamber. Once nominations are received members then vote on one business to be honored at the banquet. This event is a great way for kids and adults to get active and have fun during the cold winter season. The 13th Annual Freeze Your Caboose Off – Walk/Run is a 5k run/walk around St. James. There are seven age group categories. The staging area for the event is the St. James High School cafeteria. T-Shirts and hot chocolate is available for the participants. 2019 event will be held on March 23rd Click here for details. Pheasants Forever Ice Fishing Event is open to all who are interested in dropping a fishing line into the frozen St. James Lake on Sunday, February 10, 2019. This is not a fishing contest, just an event for those who enjoy ice fishing or wish to have that first time exposure to ice fishing. March 23rd 2019 is the 13th Annual Freeze Your Caboose Off – Walk/Run is a 5k run/walk around St. James. There are seven age group categories. The staging area for the event is the St. James High School cafeteria. T-Shirts and hot chocolate are available for the participants. St. James School District 840 Foundation – Cash for Kids is an excellent fundraiser by the 840 Foundation. Sunday all afternoon is full of events, held in March for the entire family and includes a food stand, silent auction, and live auction. Some of the items for sale are items which have been made by the students. The proceeds of the fundraiser are used to purchase those items for the classrooms that are not in the budget. None of the item is used for extracurricular activities. The St. James Area School District 840 Foundation board is made up of teacher and members of the community that are concerned about the growth and development of the students in the school district. The Hanging Basket Luncheon is held in April of each year to fund the planting and maintenance of the flowers in the hanging baskets which are in the business district of the community. The luncheon is sponsored by the business community and is held in the community building. Lunch is served from 11:30 am to 1:00 pm. Takeout’s and deliveries are available. The lunch is a free-will donation and is well supported by the community. Hot Dog Days is an annual event where various non-profit organizations in the community are given an opportunity to raise funds for their organization. Businesses and individuals sponsor the organizations by paying for the hot dogs, buns and advertising. The organizations set up their stands in the business district, as well as at Super Fair Foods and Fleet and Farm and sell the hot dogs along with an assortment of condiments. It is amazing the specialties that are used to spice up the hot dogs. Many organizations also sell baked goods and beverages. Customers can purchase the hot dogs from 11:00 am until 1:00 pm. The City of St. James Street/Park Department provided picnic tables for the customers and 1st Avenue South from Armstrong Boulevard S to 4th Street S is blocked off for pedestrian traffic only during the event. The Good Samaritan Bowl is an annual fundraising event which is used by the St. James Good Samaritan complex to purchase specific items which enhance the facilities. This is a team event and supporters of Good Samaritan are encouraged to participate in this fundraiser. Good Samaritan campus in St. James has three main units which range for complete independent living to assisted living and the skilled care facility. Step back in time at the annual Railroad Days celebration. This event is a week of fun that celebrates our railroad heritage. Stop by the Model Rail Club where there are a variety of villages and trains in different scales to view, including hands-on interactions for the kids. Visit the historical society museum to take in the many collections and displays featuring St. James history. Enjoy a beverage, a pork chop dinner, and live music at the fairgrounds. Pull out your clubs and challenge yourself at the St. James Golf Invitational tournament. Saturday is the main event with turtle races, trolley rides, an antique car show, a pancake breakfast, a children’s theater production, a local photographer exhibit, sports tournaments, the Gandy Dancer Parade, and evening entertainment at the Fairgrounds. Railroad Days 2019 is the week of June 16th. Railroad Days is a week filled with all types of venues and fundraising activities, always held the full third week in June. Various businesses sponsor fundraising actives prior to Railroad Days week, so you need to check the community calendar as to when these activities occur. They include such activities as a pancake breakfast fundraiser with a pie auction and participation in Hot Dog Days. The Railroad Days Committee is made up of volunteers who are willing to dedicate many hours to provide a successful Community Celebration on an annual basis. You will have the opportunity to participate in the parade, so stay tuned for more details. 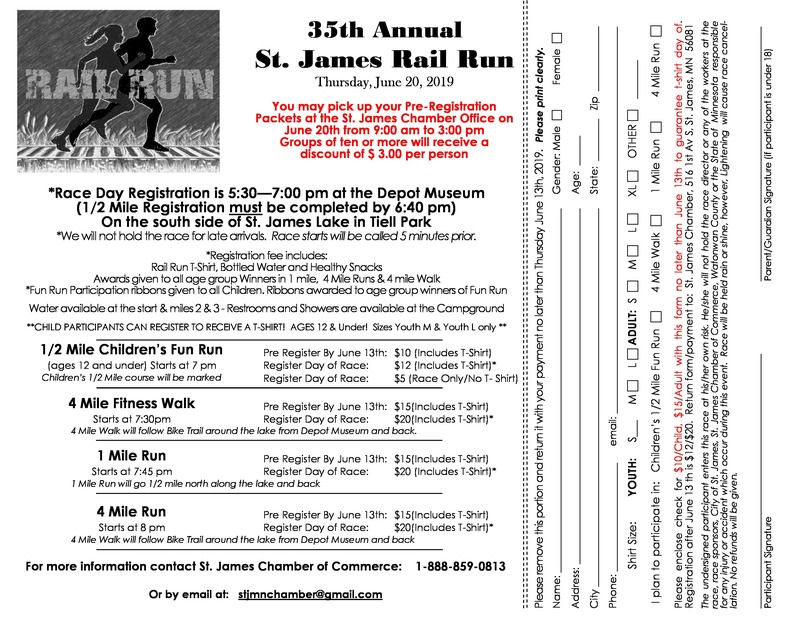 The St. James Rail Run/Walk is Thursday, June 20th, 2019. The run/walk is held annual in conjunction with St. James Rail Road Days. This is a fun family event for all ages which is held rain or shine. The Rail Run has multiple events including a 4 mile run, a 4 mile walk, a 1 mile run, and a 1⁄2 mile children’s fun run. Registration is at the historical railroad museum which is open to the public. The 4 mile walk is a nice leisurely walk on the St. James bike/walking paved trail around St. James Lake. The 1 mile run goes along a city street and partially down Memorial Drive. The 4 mile run is on the St. James bike/walking paved trail around St. James Lake. Water is provided along the route for the 4 mile run. Advanced registration is recommended. Souvenir t-shirts are provided to those runners who wish to purchase them. At the end of the run bottled water, snacks and awards are presented to participants. If you would like to participate in the Rail Run please download the Rail Run Registration Form 2019. Join in the fun and cheer for the participants! St. James Community Golf Invitational is held at South fork Golf Course in conjunction with Railroad Days. This event is an opportunity for anyone who can play golf to enjoy a great afternoon of best ball golfing. The course has the ability to facilitate up to 36 – (4somes) teams. Followed by a supper meal as part of the golfing package. Sponsors and non-golfers are encouraged to attend the supper after the golfers finish the invitational. Businesses sponsor each hole and a hole-in-one is also sponsored with a great prize. Door prizes are given at the end of the evening prior to the Ball Drop Event. There are a limited number of drop ball tickets available for purchase. The Invitational benefits the St. James Rotary Club, St. James 840 Foundation and St. James Area Chamber of Commerce. 4th of July concert in the Park and Fireworks. Annually the City of St. James hosts a 4th of July Concert in the band shell which is located on the north side of Memorial Park. The concert is held in conjunction with a fundraiser by a local non-profit organization that hosts a meal which benefits the organization. At dusk fireworks are displayed over St. James Lake. The cost of the fireworks is borne by local service clubs and individuals interested in providing this event for the area community. The Minnesota fair season kicks off in Watonwan County. Nothing beats a county fair- think cotton candy, carnival rides, cheese curds, 4H exhibits, tractor pulls, live music and animal barns to explore. The 142nd annual county fair is held in St. James at the fairgrounds. The fairgrounds are located in the southeast corner of the city along 11th Street South. In addition to a carnival, there are 4-H exhibits, a horse show, and tractor pull, recognition of a Century Farm and Senior Citizens, excellent food vendors and a commercial building which displays a number of interesting exhibits. The fair coordination is done by the Watonwan County Agricultural Association. The association is always looking for volunteers to assist before, during and after the fair, they can be contacted via their website: watonwancountyfair.com. The July 26th 2019 22nd Annual Relay for Life will be held with fundraiser events prior to the Relay for Life evening. Cancer survivors take the first lap around the track. Cheered on by the other participants and the sound of upbeat music, the Survivors Lap let’s all cancer survivors at the event celebrate their victory over cancer. At the candlelight Luminaria Ceremony we remember loved ones lost to cancer, support people who currently have cancer, and honor people who fought cancer in the past. It’s a powerful part of the event because it provides an opportunity for people to work through grief and find hope. The Closing Ceremony celebrates what we all just accomplished together. It’s also a time to remember the lives of those lost, and to commit to continuing the fight against this disease over the next year. Held on the first Thursday in August and is sponsored by the City of St. James. The north shelter at Memorial Park is the site of the Free Will Donation meal. Refreshments are available for sale by a local non-profit organization. The local emergency services – St. James Police Department, St. James Fire Department and St. James Ambulance Service all have vehicles and staff available for residents to view the equipment and talk to the employees/volunteers. Games for kids are also part of the event. A Concert in the Park is also held during and after the meal. The Multicultural Fiesta in St. James is an annual event that celebrates the many diverse cultures of the residents of our community. Come to beautiful downtown St. James and enjoy live musical performances including ethnic dancing. Get a taste of different cultures by sampling food from Germany, Guatemala, Scandinavia, and Mexico, to name a few. 2019 date is yet to be determined. The community will be invited to attend the third annual Multi-Cultural Fiesta sponsored by the “Uniting Cultures” planning committee. This date usually coincides with the celebration of the Mexican Independence Day which celebrates Mexico’s independence from Spain. The event is an opportunity to not only share cultures with food vendors, exhibitors, but also music and dancers representing many nationalities. This is a family oriented event and is scheduled to start at 4:00 pm and ends at 10:00 pm. The fiesta is sponsored by a number of corporate sponsors and nonprofit organizations. Any culture is invited to contact the planning committee to participate in the fiesta. The Children’s Halloween Parade is held the Monday before Halloween in conjunction with the St. James Community Education Department of the Independent School District 840. The children dress in the costumes which they normally wear for Trick or Treating and most are accompanied by a parent or adult guardian. The parade starts promptly at 5:00 pm at the corner of Armstrong Boulevard South and 2nd Avenue South (south side of City Hall). The route is the business district as businesses participate by handing out treats for the children. After the parade the children can attend a fun filled evening at Armstrong School. A snack is served along with a variety of games to occupy the children. Join St. Pauls Lutheran School for the annual Trunk or Treat event. This is a great way for children to be able to attend a trick or treat event in the safety of the School parking lot. Sponsors decorate the trunk of their vehicles for the event so that your children are able to trick or treat at each trunk. There are treats, children’s games, and a free meal. This is open to the public and free. Takes place October 27, 2018 from 5 p.m. – 7 p.m. at 315 9th Street S. Saint James, MN 56081. See Flyer for details. The Artwalk Fall Luncheon is an annual luncheon fundraiser for the Artwalk St. James project! This year the luncheon is on November 13th. Hot chocolate and candy canes, Santa Clause and a lighted parade. Let’s celebrate the holidays in St. James! Shop local this holiday season and enjoy great discounts from your favorite retailers during the Winter Carnival. There’s plenty of fun for all ages with a lighted parade, pictures with Santa, a free movie at the Princess Theater, Santa’s Gift shop for children to purchase Christmas gifts at a reasonable price, a Medallion Hunt, and much more.